Hi ladies! I've been neglecting the blog lately unfortunately as I haven't been in the mood to do much blogging. But I'm getting my mojo back slowly don't worry ;) I love a good bargain so I couldn't go past the Models Prefer Beauty to Go sets a while back. They have so many cute sets that are on trend and for such a good price! There are a couple of different colour combos and sets available but I picked up the Little Black Dress and Star Dust combo because I am loving the black and white toppers. 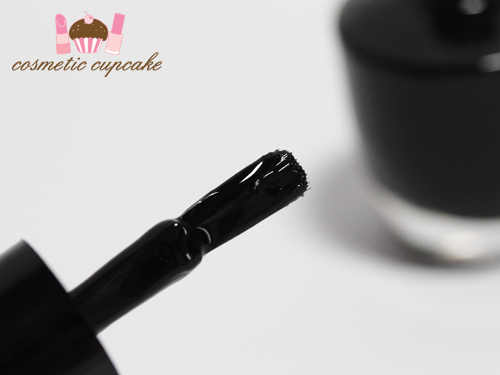 Little Black Dress is a super opaque black creme that dries to a wax look finish. The formula applies really well and you could get away with 1 coat however I used 2 coats which is pictured. It has the potential to be a one coater but unfortunately the brush is absolutely terrible! I found it way too thick and the shape is too squoval and it made it impossible to get a clean finish. These swatch pics are my 2nd attempt at trying to apply the polish! Dry time is a little slow too I found. 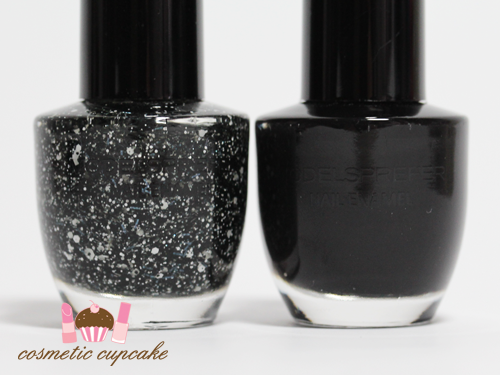 Star Dust contains black and white hex and bar glitter in a black base. I didn't know it was in a black base until I swatched it over white! It applies a little sparse but it's not too bad - I found swirling the brush around in the bottle picked up more glitters making it easier to get them on the nail. 2 coats is pictured over 2 coats of Little Black Dress. Here it is over a few different bases so you can see clearly what the glitters look like. From L-R: OPI Alpine Snow, Models Prefer Little Black Dress, Rescue Beauty Lounge Concrete Jungle and Alpine Snow again. Overall: I'm a little disappointed but LBD and Star Dust are a cute combination! I wish the brush was better so LBD could apply easily and also that Star Dust was in a clear base so I could apply it over pastel colours without the black tint. But for $5 it's not too bad! Details: The Models Prefer Beauty to Go set in Little Black Dress and Star Dust are available from Priceline for $5. It's kind of easier to do Instagram isn't it? Makes me wonder If i'd rather do that than blog-but then the world would miss out on my stories! HAHAHA!! Hate when the brush is wonky! I also prefer glitters to be on a clear base so that I can use them with any polish. These still look great though! It is a little weird that they would put a black & white glitter in a grey tinted base, and pair it with a black polish to boot... Not going to see much of the awesome black glitter if you use them together and they are marketed... oh well! I think what I would do with stardust is grab one of my empty polish bottles, pour it into that, and add another glitter polish into it! That would give it some sparkle and maybe dilute the grey base enough to make it versatile. It would be super unique then! I really like the look of the Stardust :) It works well over pretty much any colour ! I really hate applying black nail polish with a bad brush, it gets so frustrating :( ! I just found your blog and I love it! Who designed your logo?